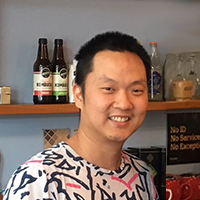 Follow your passion, says business alumnus Nam Do who came to AUT as an international student from Vietnam and now owns the popular Fusion Café in Ponsonby. “My advice for other students is to take the time to identify what you love to do and make those decisions for yourself. Nam bought Fusion Café with his wife in 2015, after working there as the manager for a number of years. “Successfully establishing our own business has been one the highlights of my career so far, and I’m proud of the fact that we were recently named as one of Metro magazine’s top 50 cafés in Auckland. What he loves most about his work is that no two days are the same, Nam says. “Every day presents new challenges and opportunities. It’s a challenging industry to be in, so you have to think creatively about meeting the needs of your customers, which makes the work really interesting. The people I interact with every day come from all backgrounds, and there’s a community feel in the work we do. His parents encouraged him to study in New Zealand, says Nam who came to Auckland to attend Mt Roskill Grammar School before enrolling at AUT to study business. He appreciated the freedom of choice AUT’s Bachelor of Business offered. “I liked that we could try papers from different majors in our first year before deciding which one was right for us. I had a lot of support and helpful information sessions run by AUT staff to ensure I chose the majors that were right for me. But getting a taste of everything first was great. The Bachelor of Business prepares you well for the future, Nam says.